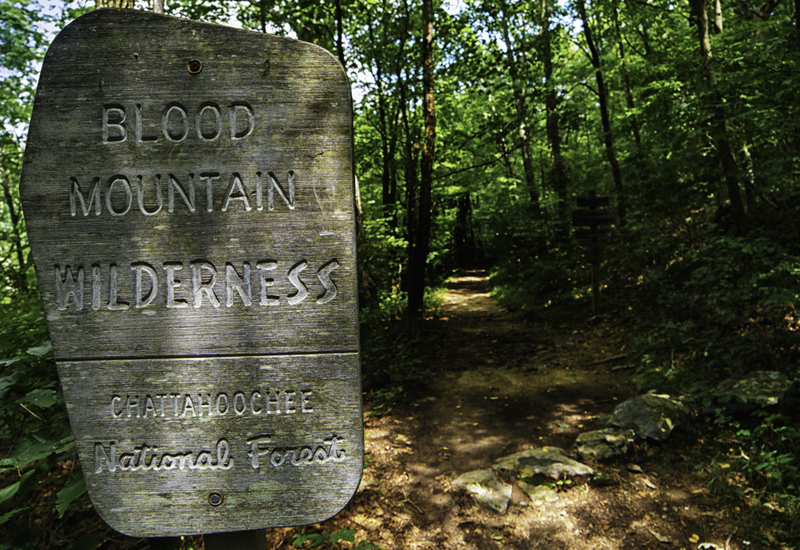 ← Mountain Crossings Named a Top 100 US Outfitter! Blood Mountain is the most popular section of the Appalachian Trail in Georgia. On all but the stormiest winter days there will be people seeking the summit from which you can get a fantastic 180 degree view of the south and east. Below are a rough map and some details. The map is for general reference, we do not recommend using it for backcountry navigation. We sell more accurate maps at our shop. If you want more information on shuttles and our shop click here. Blood Mountain is 4,458 feet tall. Mountain Crossings at Neel Gap is at 3,107 feet and the hiker parking area is at a 3007 feet. How hard is it to get to the top? From the parking area or our shop it’s about 2.2 mile and over 1,300 foot elevation gain. We consider this to be a moderately strenuous hike but if you take some water, and take your time almost anyone can easily make the summit. People from age 3 to 93 hike it on a regular basis. Make sure to bring water and to be prepared for cooler temperatures at the top. Don’t forget to check a weather report before you head out and be prepared! Water: The few streams that run on Blood Mountain are not dependable so pack it in. Parking for Hikers: Please park at the Byron Herbert Reese Parking area. It’s a quarter mile north of our store. If it’s Monday through Thursday you may ask the staff if it’s ok to park your car at the shop. The parking area has about 40 spots and is regularly used for multi-day hikes. Cars are often parked there for a week at a time without issue. On the weekends (especially on holiday weekends or during great weather) the parking lot can be full by mid morning. If there are no spots we recommend that you be persistent and circle the lot for a bit. If there are still no spots there are a couple unofficial parking spots just down the hill (north) from the lot just off the road. We don’t know of anyone having issues parking here but please, be very careful walking alongside the road. Allowing hikers to leave cars in our small lot would mean that there would be no spots for customers. So please respect the policy. 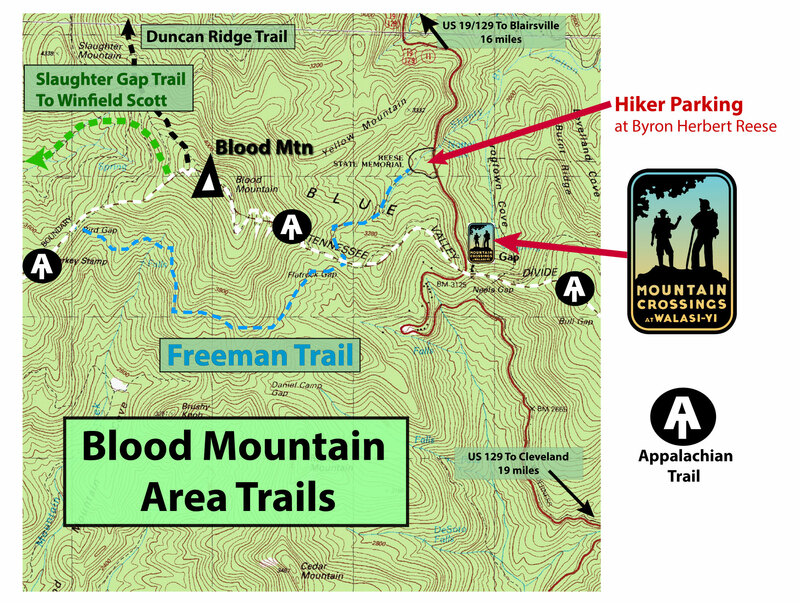 Accessing the trail from the parking area: From the Byron Herbert Reese parking area you can take the Byron Herbert Reece Spur Trail – Formerly known as the Blood Mountain Spur Trail – up to Blood Mountain and the Freeman Trail. The BHRST climbs over 400’ in just 0.7 to the AT junction at Flatrock Gap. From there you can follow the white blazes to the right to summit Blood Mountain, or continue straight to follow the blue blazes onto the Freeman Trail. Up and Back: Most people hike to the top and back (a total of about 4.4 miles). Generally this takes 2 to 3 hours. The Freeman Trail runs 1.8 miles from it’s junction with the AT at Flatrock Gap to it’s junction with the AT at Bird Gap on the other side of Blood Mountain. Though there is less elevation gain and lost on the Freeman Trail compared to hiking over Blood Mountain it is a less travelled trail and a bit rocky. It is a beautiful hike and can offer a bit more solitude than the Blood Mountain section of the AT. If you are going to hike this section we recommend you carry a map. Hike a loop! We highly recommend hiking from the BHR parking area to the junction at Flatrock Gap and continuing on the Freeman trail to Bird Gap at the back side of Blood Mountain. From there you take a right onto the AT and summit Blood Mountain from the back rewarding you with it’s outstanding views. From there you continue on the AT down the front of Blood Mountain and back to Flatrock Gap where you can catch the BHR spur trail back to your car. This loop is about 6.1 miles long. There are several junctions along the way so we recommend that you carry a map to hike this loop. Lake Winfield Scott and Vogel State Park: You can also hike over Blood and to the Lake Winfield Scott recreation area via the Slaughter Gap Trail. You can also take the Duncan Ridge Trail from Blood Mountain to either the Coosa Backcountry Trail (recommended as an overnighter or for those with backcountry experience only) or to the Bear Hair Trail which will take you down to Vogel State Park. We recommend taking a map and talking to a Mountain Crossings staff member or someone who has experience with these hikes before attempting them. In the case of the Duncan Ridge Trail to Vogel we have found that the maps are not very accurate and some local knowledge may help you avoid mistakes. Woody Gap to Neel Gap: This is a great day or overnight hike that offers great views from Blood Mountain and Big Cedar Mountain. 11.5 miles. Click here for more info. Neel Gap to Hogpen Gap/Unicoi: The section of the Appalachian Trail north of Neel Gap is said to be the prettiest in Georgia. It’s 9 miles to Hogpen and just over 20 to Unicoi. Click here for info on Neel to Hogpen, and here for info on Hogpen to Unicoi. Feel free to call the shop for more info. This entry was tagged backpacking, Blood Mountain, Day Hikes, hikes, hiking, mountain crossings, Trail. Bookmark the permalink. Trail QUESTION: The CHATTAHOOCHEE TRAIL intersects the AT about 2-3 miles NORTH of Hog Pen…..IS IT MARKED???? ?